A powerful MPEG AVI WMV MPG Editor that helps you to create a professional quality videos from your personal videos, digital images and audio files. To dispel any worries about using a complicated software, HT Video MPEG AVI MPG Editor has adopted a user-friendly interface. And a number of highly useful features have been selected to ensure that first-time users will not lose their way in a sea of buttons. Need AVI DVD DivX MPEG Converter Click Here ! Need Colorful Movie Editor Click Here ! Using its built-in compression engine, HT Video MPEG AVI MPG Editor can save the edited video as a small, yet high-quality, MPEG-1 or MPEG-2 video file. It can also compress and save AVI (compressed AVI file), DV-AVI, and Windows Media Video (WMV) files. With HT Video MPEG AVI MPG Editor, you can manage and edit multiple files simultaneously. For each video file, you can select Full Rendering, Smart Rendering, or Fast GOP (Group of Pictures) encoding methods. 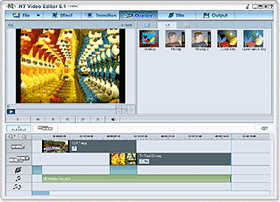 HT Video MPEG AVI MPG Editor allows you to output text over the video and insert music files into the video. Adding and editing files has been made easier with a drag-and-drop capability.. Merging video files has been made easier with the cut and merge facility. The Edit Title function has been added so that users can easily add titles to videos. You can experience various filter effects by using the Special Effects function. The Overlay function has been added so that you can create various effects. With the addition of Timeline, editing has got easier..
A Project function has been added. You can save the current job as a Project so that you can easily recall and continue the job you were working on. The videos you recorded with your camcorder can be sent to a PC and converted to digital format for lifetime preservation.